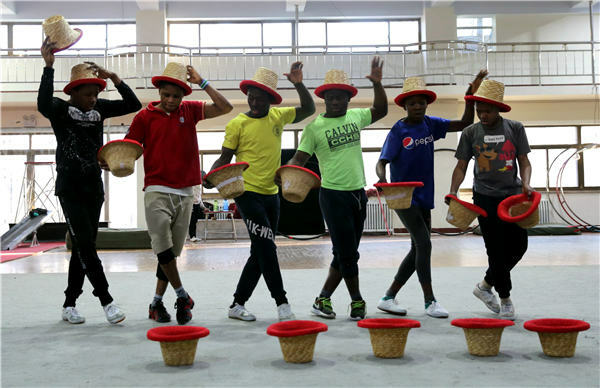 Students from Laos, Ethiopia, Sierra Leone and Tanzania study various performing skills at the Hebei Wuqiao Acrobatic Art School. They will be ready for public performances upon their graduation in August. Wuqiao, considered to be the birthplace of Chinese acrobatics, is also a big draw for talent from abroad. Houng Pa Sith Yang first arrived in Wuqiao, a county in North China's Hebei province, in the summer of 2016 to receive training at the Hebei Wuqiao Acrobatic Art School. The school, which is surrounded by farmlands and narrow lanes, is different from Yang's home in Vientiane, the capital of Laos. Yet, she was full of excitement. "Everything I learned here in China is new, especially the acrobatic techniques," says the 26-year-old, who started practicing acrobatic moves at 9 years old under the guidance of her aunt, a former acrobat who taught at acrobatics schools in Vientiane. "I also learned Chinese for two years." Yang has been an acrobat with the Laos International Circus since 2012. Her studies in Wuqiao will end in August and she will return to Laos and continue to tour with the troupe internationally. One of the things Yang learned at the Chinese school is performing with hula hoops. Starting from scratch, Yang practiced five hours a day for three months. Now, Yang, who weighs 45 kilograms, can perform with 100 hula hoops orbiting her body at once, she says. The other things she learned include ropewalking and plate spinning. Yang is one of the 35 foreign students currently studying at Hebei Wuqiao Acrobatic Art School. According to Mu Hongyuan, the deputy-director of international exchange program at the school, the students are from Laos, Ethiopia, Sierra Leone and Tanzania and will graduate in August. Wuqiao is considered to be the birthplace of Chinese acrobatics. Yang Shuangji, the former director of the Wuqiao County Cultural Relics Protection and Management Institution, says acrobatics in the county dates back to the Eastern Wei Dynasty (534-550). And the art form reached its peak during the Yuan Dynasty (1271-1368). Now, the county not only trains acrobats but also functions as a platform for international exchanges. Since its founding in 1987, the China Wuqiao International Circus Festival has staged over 600 performances with acrobats from more than 50 countries. 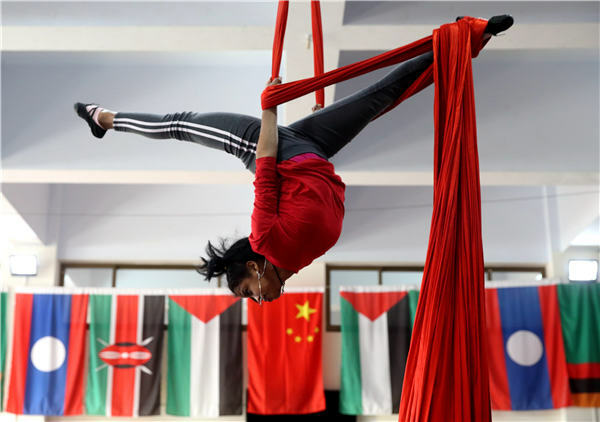 Also, the Hebei Wuqiao Acrobatic Art School, founded in 1985, has not only trained Chinese acrobats but more than 400 foreign students from developing countries as part of a cultural exchange program that was launched by the Ministry of Culture and the Ministry of Commerce in 2002. The foreign students usually start training at 8 am with exercises to build flexibility and practice basic skills of somersaulting and handstands. Then, after a one-hour lunch break, the afternoon is devoted to practicing different circus acts. By 5 pm, they complete a day of training. In between, they also learn Chinese taught by teachers of Hebei University. "After the whole day of training, I like eating hotpot and barbecue with my classmates," says Laotian student Yang.